President Dwight D. Eisenhower was the 34th man to hold the office as the Commander-in-Chief of the United States, but also led an amazing life in and out of office. Just months after his death in 1969, the United States Mint issued new coinage featuring his bust on the obverse side on the first silver dollar issued in the US since 1935. Today, 40% Silver Eisenhower Dollar Coins are available to you online at Silver.com. Arrives inside of protective packaging in BU or Proof Condition (Our Choice)! Available from 1971 to 1978! Consists of .3161 Troy ounces of actual silver content. On the obverse side is a bust of Dwight D. Eisenhower. The reverse of the coins includes a design of the bald eagle based upon the Apollo 11 mission to space. Both designs from Frank Gasparro. 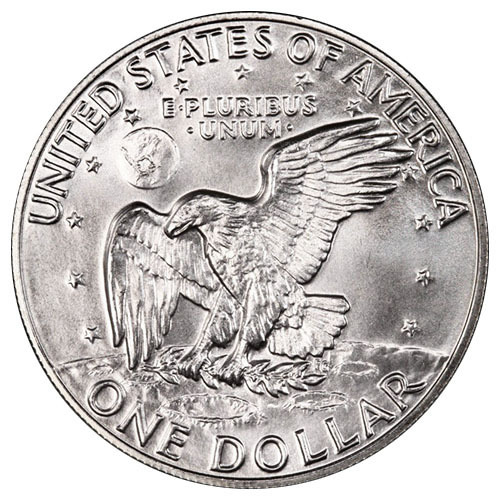 In 1969, the United States Mint was considering the reintroduction of silver dollar coins for the first time since the Peace Silver Dollar was halted in 1935. The rising prices of silver bullion in the 1960s led the US Mint to end the production of silver coins with previous 90% silver content. There was talk of making the new Silver Eisenhower Dollar Coins available with 40% silver, but it was relegated to a smaller collectible issue of the coin. All of the 40% silver Eisenhower Dollar Coins in this product listing come from that collectible coining of the Eisenhower design. The US Mint concluded it was best to use a copper-nickel clad combination for circulation silver dollars with Eisenhower’s bust and limit the issuance of 40% silver coins to collectible Eisenhower Silver Dollars. As President of the United States, Dwight D. Eisenhower is remembered for presiding over one of the most robust periods of economic growth in American history. His administration spearheaded the Interstate Highway System, promoted science education through the National Defense Education Act, established NASA to promote American space exploration, and signed the landmark Civil Rights Act of 1957 while sending federal troops to forcefully integrate schools in Little Rock, Arkansas. 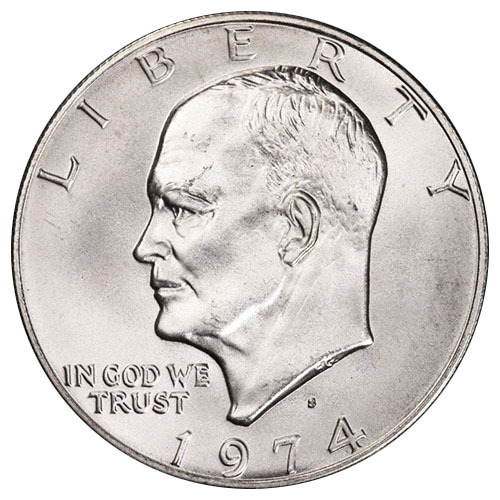 On the obverse of the 40% Silver Eisenhower Dollar Coins is a left-profile bust of President Dwight D. Eisenhower. His image is featured along with an engraving of “Liberty” above his head. Eisenhower was a five-star US Army General during World War II, leading Allied forces as the Supreme Allied Commander in Europe and was the first-ever Supreme Commander of US Forces in Europe following the war. The reverse of the Eisenhower Dollar Coins features another design from Gasparro. This one depicts an American bald eagle landing on the surface of the moon with an olive branch. The design is based upon the mission patch of the astronauts from Apollo 11. Please feel free to reach out to Silver.com with your questions. You can call us on the phone at 888-989-7223, chat with us online using our live chat, or simply send us an email with your inquiries.